As I’ve stated numerous times before, I am a rank amateur when it comes to the technical aspects of photography. My ineptitude concerning ISO, aperture, and shutter speed (and lots of other technical terms that scare the heck out of me) has frustrated my creativity on numerous occasions. This frustration has propelled me toward taking a photography course sometime this year. Needless to say, I make more than my share of mistakes. The bloopers are usually deleted without a second thought. Occasionally, though, a “mistake” steals my heart because it captures an aspect of the moment better than I ever could by doing everything “right”. I thought I’d share some of my happy accidents and the reasons why these shots ended up in the keeper file instead of the trash bin. 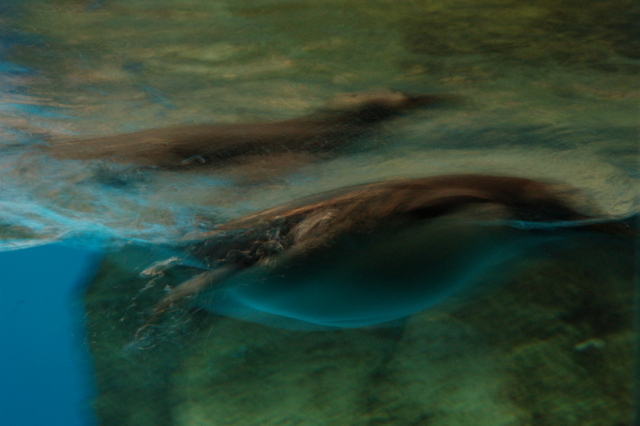 The first two photos were taken in the Penguin building at SeaWorld Orlando in Florida. 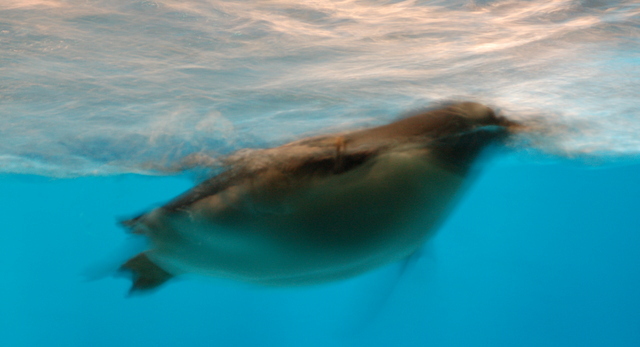 Conditions for photography were dismal – dark room, moving sidewalk, exhibit behind glass, penguins swimming at the speed of light. Not expecting any shots worth keeping, I still felt compelled to give it a try. I wasn’t able to acquire one clear image. Instead, I ended up with two interesting abstract compositions that aren’t so much about cute little birds in tuxedos as they are a representation of movement and speed in rich, vibrant colors. I live less than an hour from Hershey Park, a popular amusement park located in Hershey, Pennsylvania. Almost every summer we spend a day there, enjoying the thrills from park opening to closing. The Scrambler is usually our last hurrah before we head home. 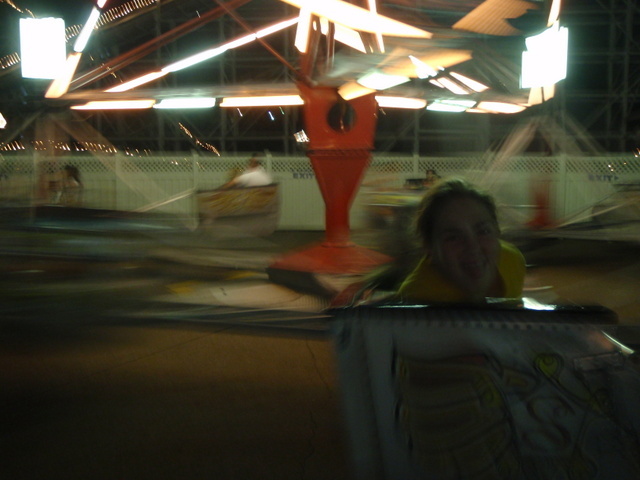 It’s a fast, spinning ride that creates incredible centrifugal force. The person in the outer position in each car gets crushed, so copious amounts of laughter and screaming always accompany the ride. It’s as much fun to watch as it is to take a spin. By normal standards, the two photos above are sub-par. They are too dark and very blurry. Why do I love them? 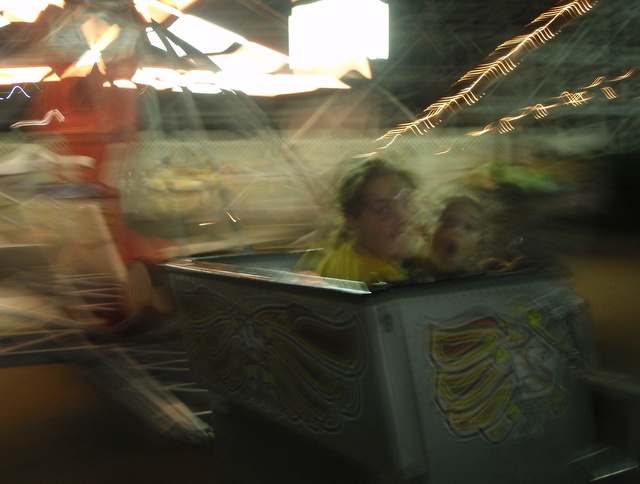 Because they perfectly capture the speed and energy of the ride and the emotions of my daughter and niece. If I had to choose, I’d pick the second shot because there is less artifact, but the expression on my niece’s face in the first one is priceless. I’ll be keeping both images. Every time I look at them, I’m instantly transported back to that night and I have to smile. Everything about this photo is wrong. The orange coloring, the candlelight reflected on the lens, blah, blah, blah. 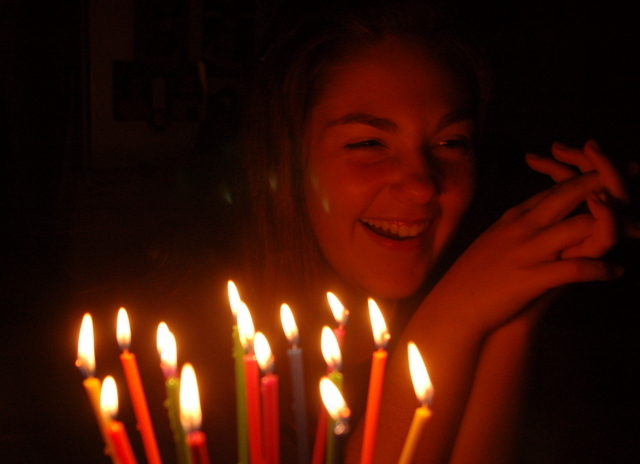 But somehow I still managed to so completely capture the spirit of my daughter on her 15th birthday that all the technical no-nos don’t even matter. The smile, the crinkled nose, the position of her hands – everything is unposed and natural. Can you hear her laughter? I thought so. This is definitely a keeper. This last image is my most recent mistake and the impetus for this post. 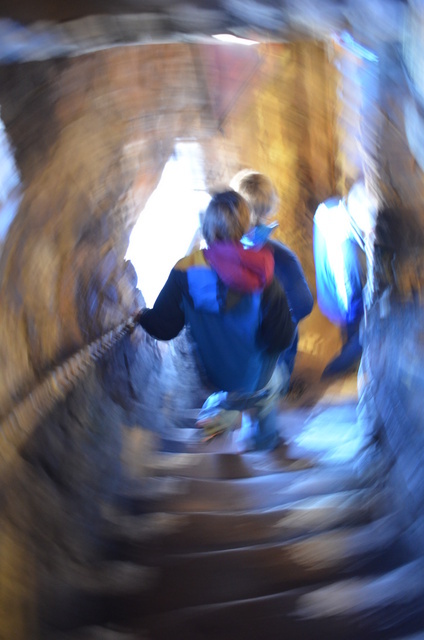 It was taken inside the historic Desert View Tower at the edge of the Grand Canyon. I fell in love with the building, both inside and out, and took copious amounts of photos. On the way down the stairs to the first floor, I attempted to take a photo of my sons. The stairway was very poorly lit and I could tell right away the shutter was going to stay open too long for a crisp image. In resignation, I pulled the camera away from my face before the shutter closed. Look what I got – a circular blur! 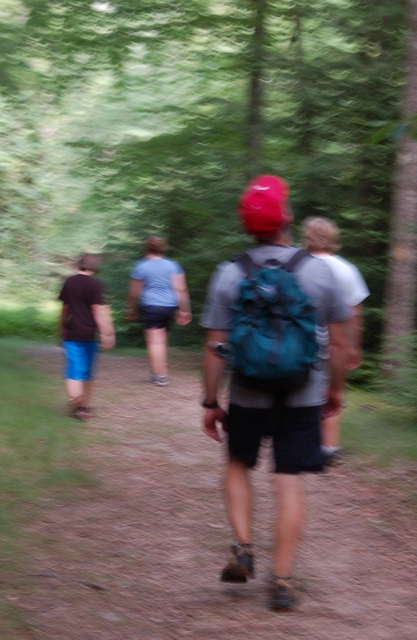 It looks like the boys are traveling through a time warp. It’s a very cool effect that, once again, I’m not sure I could have produced if I’d intentionally tried it. Photography has always held an element of uncertainty and even a bit of magic for me. I never know exactly what I’m going to get when I finally press that shutter release button (is that what it’s called?) and I like it that way. Wonderful accidents pop up now and then that surprise and delight me. Hopefully, the camera magic that I trifle with now will only become deeper and stronger as I gain a better understanding of the technical aspects of taking photographs. I’m looking forward to the learning process, the new discoveries, and the many “mistakes” that are sure to appear along the way. Do you have any favorite photographic mistakes you’d like to share? I would love to see them! I enjoyed reading your blog. You definitely have the gift of word! I really enjoy taking photos! There is so much to learn. My philosophy is to take lots and lots of photos, and you might get a few good ones! After years of taking photos, I finally took a photo class. I learned what all those other buttons are for, which was interesting. I also learned a lot about shutter speed and aperture which helps with the technical side. But I still think your “eye” for art plays a big part in it. That is something you learn thru trial and error! Thanks for sharing! I completely agree with your philosophy. It supports what I thought was the truth all along. Thanks for the kind words, too. A wonderful read Stephany and I am realy taken by the two penguin photos, as they are as you say “abstract” and rather ethereal, soft and gentle in movement and colours. Thanks, James. I find the penguin photos to be very soothing. I wouldn’t have deleted a single one. Your validated each story with strong memorable photos. I LOVE your whole approach to everything, Stephany. Your mistakes are so much more interesting than had they come out as perfect shots (ie: the photograph of your daughter is fab). Lots of people take tehnically brilliant photographs, but you’ve managed to turn your lemons into beautiful lemonade just by your creative attitude of mind. Your explanation, too, adds so much to the picture, that I seriously think you have got something here – I’m not quite sure what, but keep going with them – they’re fascinating! Collect enough of your best mistakes (with written comments) and they’d make a super book. You should seriously think about it.